This is our version of pasta puttanesca, a dish for those with adventurous palates and no fear of eating well. There are various stories about where the name and the dish came from  they’re probably all a bit of a lie. And I don’t really care. All I know is that every bite of this dish fills my mouth with rich tastes. This isn’t a dish for the faint of heart. This is a dinner meant to be shared with people who love to eat with gusto and laugh loudly instead of snickering behind their hands. This is a good meal. Would you like to make this? With our recipe, gluten-free pasta, and the best ingredients we can find to make this meal the best it can be? Sign up for our box at Lost Crates. Last week, when I put up this post about our partnership with Lost Crates, I received quite a few questions. And, I’ll have to admit, I wrote that piece quickly, at 6:30 in the morning, my fingers racing across the keyboard before the kiddo woke up. So I might have been a little vague, a little rushed. Mostly, I didn’t have a photograph of what you would be getting. So I want to tell you more today. We paired with Lost Crates because we want to bring you good food. A number of people asked me why the shipments weren’t going to be filled with gluten-free bread, cookies, and brownies. Goodness, folks, you can find those in nearly every grocery store these days! As much as we loved baked goods  and there will be boxes some months that will help you bake  Danny and I are interested in great food. Great food. Some folks complained that these were not allergy-free boxes. That’s right. We’re putting together the best collection of gluten-free food we can for you. If you have multiple food allergies, we may not be able to meet your needs. But if you have to be gluten-free, or you just love great food, these boxes are for you. * Jovial gluten-free caserecce pasta. This is our favorite gluten-free pasta in the world, bar none. And this particular shape, caserecce, might be our favorite pasta shape. 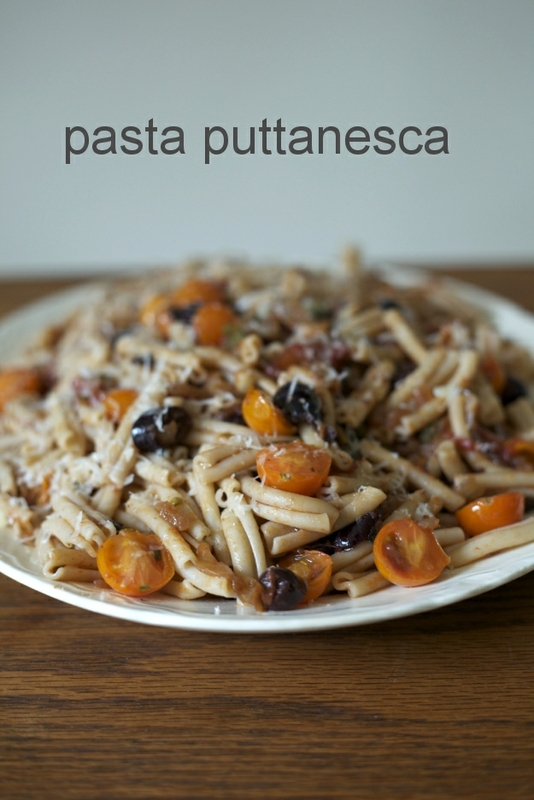 Yes, puttanesca is made traditionally with spaghetti. But since gluten-free pasta isn’t traditional, why not mix it up? And this shape works particularly well with chunky sauces. * Spanish oil-packed anchovies. Since last week, I’ve heard from a number of you, disappointed we would put anchovies in this box. Folks, don’t be afraid of the anchovy. (Our friend Michael Procopio just wrote a great post about this.) Sure, if you’ve only had them on cheap American pizza, you might be horrified. And most inexpensive anchovies in a tin are overly salty, a bit metallic tasting. But these anchovies are the best cured anchovies you can buy. They might be a revelation. And you simply can’t make pasta puttanesca without them. * Capers. Capers are salty, briny bits of goodness. Without them, there would be no pasta puttanesca. 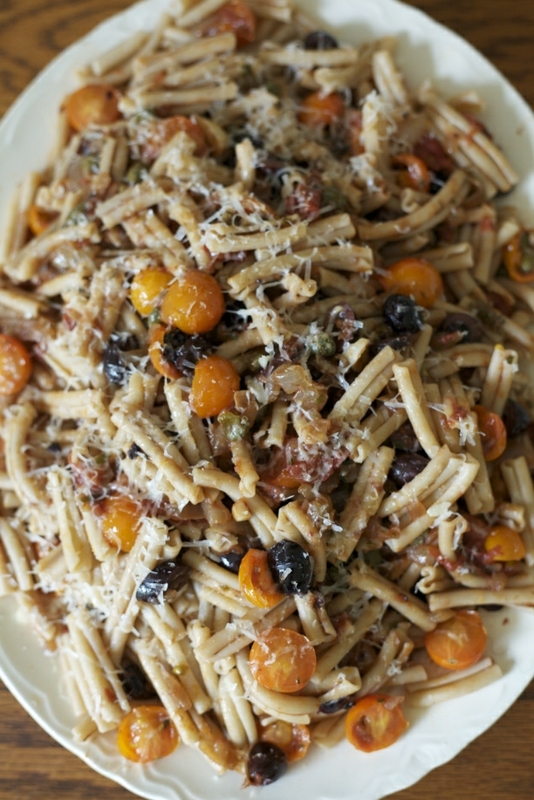 * Our recipe for pasta puttanesca. Plus, we’ll give you some of our favorite suggestions of what else to do with the pasta, anchovies, capers, and grated cheese. And, we’ll throw in a few wine pairing suggestions as well. We certainly can’t please everyone. But if this appeals to you  and the idea of receiving boxes every month with ingredients and meals like this  we’d love to see you over at Lost Crates. Puttanesca on any GF pasta is fine. Anchovies? Double up. They are great. I’m drooling just looking at those pictures. Can’t wait for my crate…. I signed up – looking forward to the boxes. The question I have will it be enough to make one serving or multiples. Doesn’t seem like enough for the money. Love the idea and look forward to my first box. i guess after adding everything up its not to bad of a deal. Of course it’s doesn’t make one serving! It’s enough to make enough to feed five adults and one hungry 4-year-old. just an FYI, they do not ship to Alaska, even though it says they ship to the continental US and we are part of the continent. I think they mean to say contiguous US. bummer. flat rate postage is the same to us as anywhere else, if they chose to use it. The picture of this pasta made me drool instantly. Thank you and the Chef again for providing us with another way to enjoy delicious gluten free food. Like you, I want more real food. Baked goods are delicious and I’m glad they’re more readily available, but I want a meal with flavors and to treasure the time spent sharing it with the people I love. I think the crates are a delicious way to make this happen at least quarterly. I love the idea of pasta puttanesca in theory – and your photos are divine btw – but I have to admit, despite loving most things salty and briny, I’ve always been a little afraid of anchovies. Maybe it’s the hair? (is that even true or just a terrible rumor?!) Anyway, I’m very very tempted. Thanks for the opportunity for great food! Awww! I know your pain Alaska! This is also a tease for your Canadian readers that Lost Crates won’t ship too. Let’s put the pressure on for them to expand! Looks good thus far–just an idea–would you consider including a small can/jar of plum tomatoes and a small container of black olives? Maybe a little spice pack? As it stands I can’t make the dish from the box contents. Just suggesting as dinner-in-a-box kit would be cool. Thanks. Danielle, we would love to, but that would drive the price up. And because the tomatoes and spices are the most easily attainable, we thought folks could provide those themselves. Such a shame there is no shipping to Finland… Would love to subscribe! oh yum, what a photo to drool over! I’ve been making Jovial’s brown rice pasta ever since your Italy posts. I’m so amazed how far gluten free pastas have come in the past few years… it’s so so tasty. Squeee!!! I’m so excited to get my first Lost Crate! Not only does that pasta look amazing, I have always been frustrated by the waste of space that is my box grater – I’m excited to try this one and to weed out the cupboard a bit. I just have to say, you’re amazing. To be able to put up with complainers and whiners when you’re trying to do something wonderful for people. Why can’t they just be grateful, and for those for whom it won’t work, I wish they would just keep their mouths shut and figure out what they need themselves. Anyway, it just makes me sad that people think they have a right to be cantankerous in someone else’s sacred space. And thank you for not contaminating your boxes with those awful baked goods–the cardboard cookies and such. That isn’t even food. I completely trust your judgment. Just checking in; I got a press release saying you’ve partnered with Frito-Lay. Do you have any comments on that? The only reason I ask is due to the obesity epidemic in this country and your apparent emphasis on local, seasonal foods. Would love to hear your side. Thanks! Hey Dani, I’m not sure the comments section on this post is the appropriate place, but I’d be happy to do so. While we mostly eat local, seasonal foods, we also enjoy a bag of Fritos sometimes, or a good dark chocolate or an ice cream on a hot day. All things in moderation, including moderation, as Julia Child used to say. Frito-Lay has worked hard to certify their foods as gluten-free, going farther than most companies these days. They’ve specified the foods that are certified gluten-free and the ones that contain no gluten ingredients. I’m thrilled to see this level of specificity and care. I cannot tell you how many times I have been trapped in an airport with nothing to eat. Sometimes, a bag of chips is something pretty great. Hi Shauna, love the site, my girlfried is allergic to gluten, which has meant that most of the recipes on my blog also end up being GF! I’m obsessed with anchovies (and capers), and try smuggle them into every dish. I was about to write a comment about how I thought salt packed anchovies were better than those in oil, but then I read the post at inpraiseofsardines that you linked to. It took me quite a bit of effort to get hold of Iberian salted anchovies in the UK, and the idea that I could have got the same quality from a jar of Ortiz anchovies in oil is somewhat frustrating but also a relief! They were infinitely better than the usual readily available oil packed anchovies (I even wrote a blog post labouring this point somewhat), but I’m off to Valencia in a few weeks so this will be the ideal opportunity to make some side by side comparisons. Always learning! Gluten free products are NOT available in almost every store. You are lucky if you can find them where you live. I must mail order almost everything! My bread and bakery goods take 3 days priority mail to get here. I guess in this respect we are not all equal. I have a relative in another state that has celiac disease and they can buy gluten free products in stores and restaurants everywhere! There is one restaurant within 50 miles of here that serves a gluten free pizza. It is very hard to go out to eat and not get sick. They either don’t know what I’m talking about or they don’t want to bother.